Instead of following the members of the Superhuman Bureau, this episode introduces and focuses on the members of a “comic band” (A band that adds comedy routines to its performances). They obtain superpowers after listening to a mind-opening concert, and these powers clue them in to a plan by the Imperial Ad Agency to craftily add a superhuman factor suppressing drug into chocolate as part of a giveaway. The episode is spent on the members of the band deciding what to do with their newfound powers, whether they should stop the Ad Agency’s plan, and debating the cost of fame. The involvement of the Superhuman Bureau in any part of this is tangential at best. This episode was much simpler than many of its predecessors, with almost no shifts in the timeline to speak of. 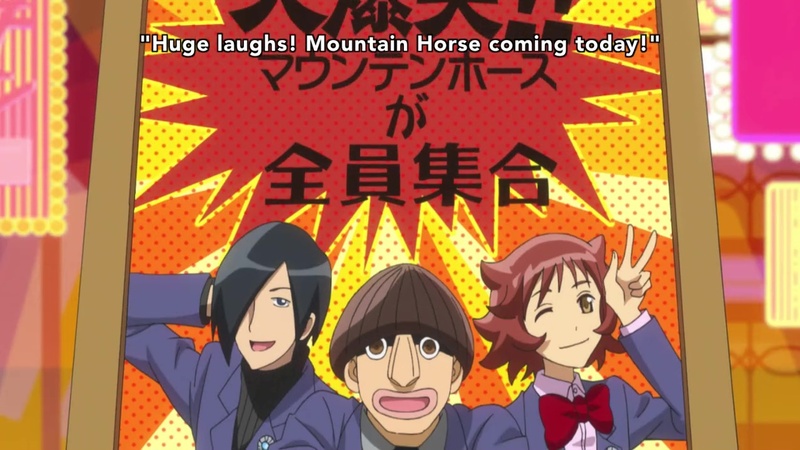 The entire episode plays out like a flashback, telling the story of the Mountain Horse comic band. 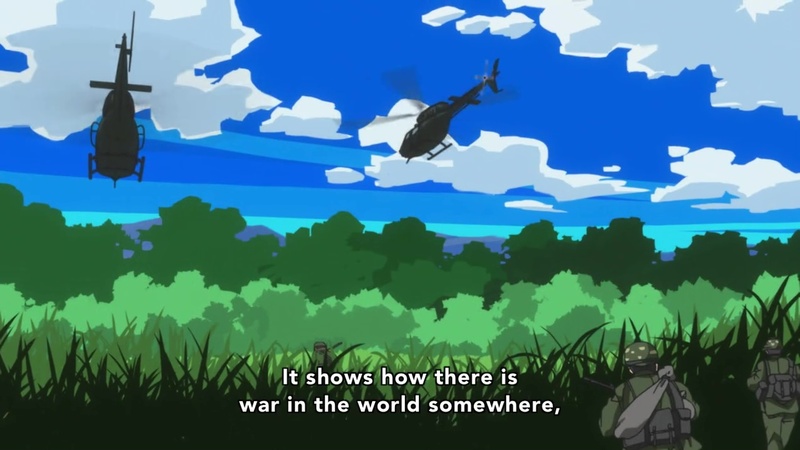 To me, this episode had the feel of establishing a lot of ideas for future plot developments, and tying up some unanswered questions from previous episodes. The actual content of the episode, while interesting enough, was relatively tame compared to what I’ve become used to from the show. It’s as if we’re taking a deep breath before plunging into what (I expect) will soon be the events that cause Jiro to leave the Bureau. The story of the band is a tried-and-true formula, although spiced up with superhuman elements. They’re a second-rate band that performs slapstick humor to get laughs, and while they enjoy being together, it’s clear to all of them that they’re not going to make it big. 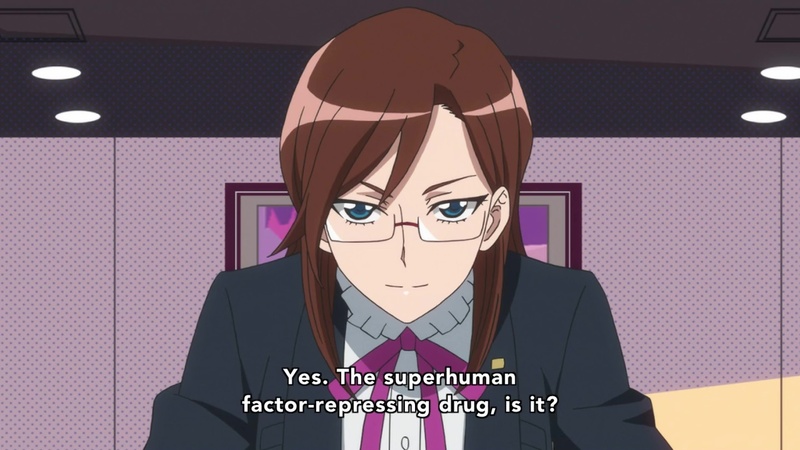 Suddenly, just after they get their powers, they discover a conspiracy to suppress superhumans with a newly developed drug. The Ad Agency is onto them, though, and offers them fame and fortune to keep them quiet. In the end, they decide that staying true to themselves/stopping evil is more important than money, and after a brief action sequence, they’re allowed to continue on into obscurity. Yes, the Bureau does show up. No, they don’t do anything of importance. This part of the episode was fine, if predictable, but the really interesting stuff is in the margins. For one thing, Ad Agency Lady finally gets a name, and its clear that her agency is being employed by the government to help stop the growth of superhumans. At the same time, we’re starting to get more information on “approved” superhumans, like the superhumans on the police force that were alluded to in Episode 2. Apparently you can apply to be approved, which lets you be open about being superhuman (the law prohibits other mentions of them), but also gives the government a great deal of control. 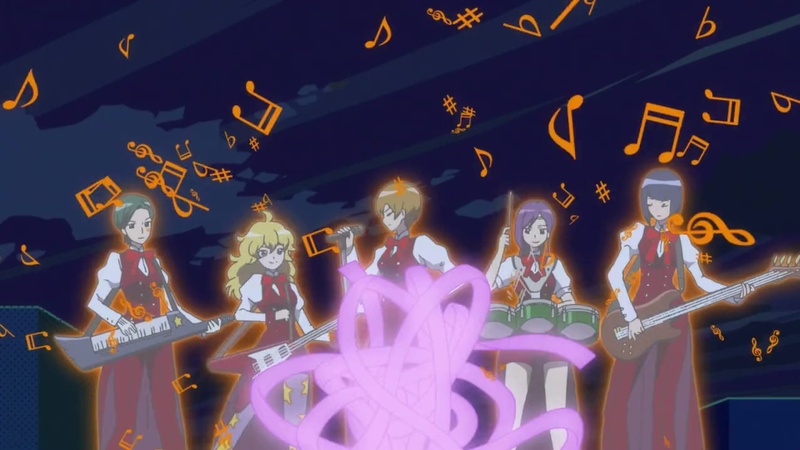 The episode highlights this by showing another band called the Angel Stars. Early on, they’re shown using their superhuman singing abilities to open the audience’s mind to an anti-war message. 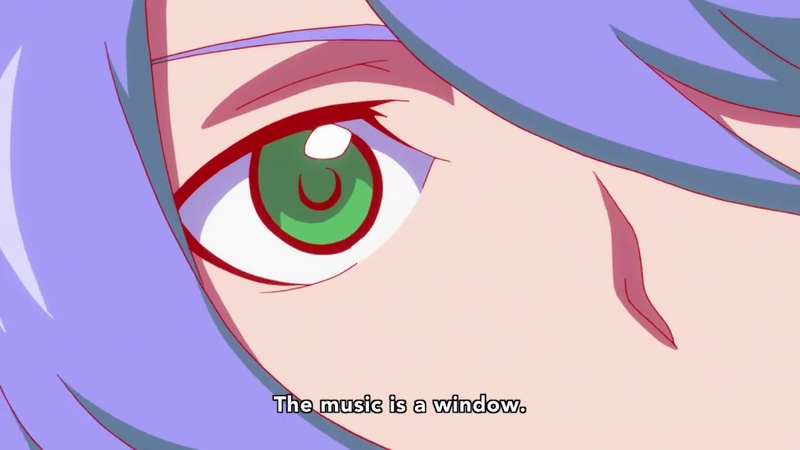 Jiro is at this concert, and is powerfully affected by their music. Later, though, as the comic band confronts the ad agency over their plan, who should show up but the newly-approved Angel Stars, this time doing the government’s bidding in an attempt to stop superhumans. Dialog between members of the ad agency makes it clear that the government was unhappy with the anti-war movement that was spawned from the Angel Stars’ original performance, and now, successful and government-approved, they are being used to combat the government’s foes. 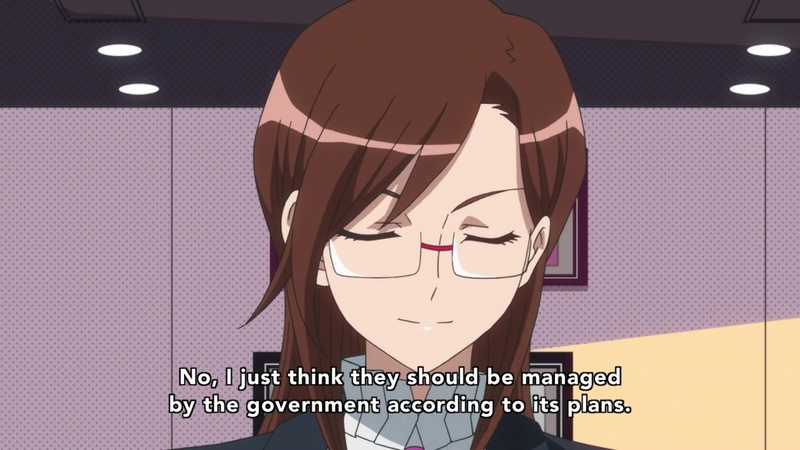 It makes for a strong foil for the comic band’s ideals, and also gives us interesting insights into the government’s objectives. Probably the most interesting part of the episode was its end. Fuurouta and Jiro, now in the future, are watching the band perform, and Fuurouta accuses Jiro of trying to convert its members to his cause. 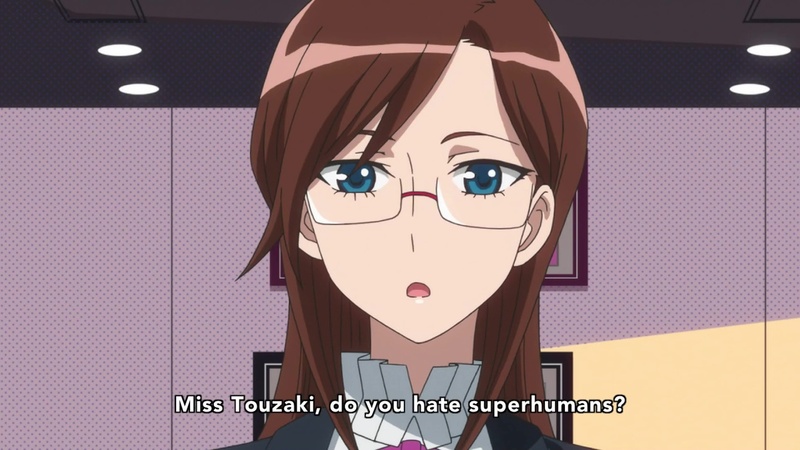 Jiro agrees, saying he’s trying to recruit superhumans to stop the Bureau. At last, we know his objective, now we just need to know his motivation. 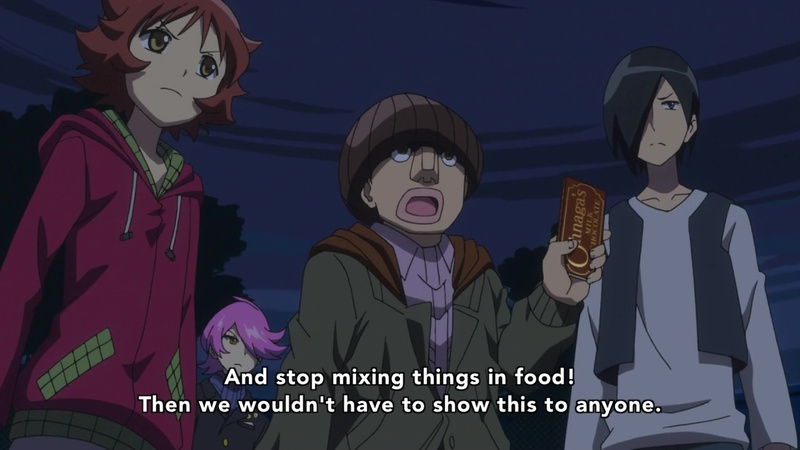 There were some oddities in the episode, though. For one, the Bureau had essentially no role in it, and I don’t feel like the comic band members will return, so it’s an episode without any real character development. For another, the showdown with the agency felt emotionally stunted. During the showdown, one of the band’s members is killed by the Angel Stars. While the other members are briefly teary-eyed, within about 30 seconds they’ve negotiated their freedom. Then, they just saunter off slowly. Seriously, dude? 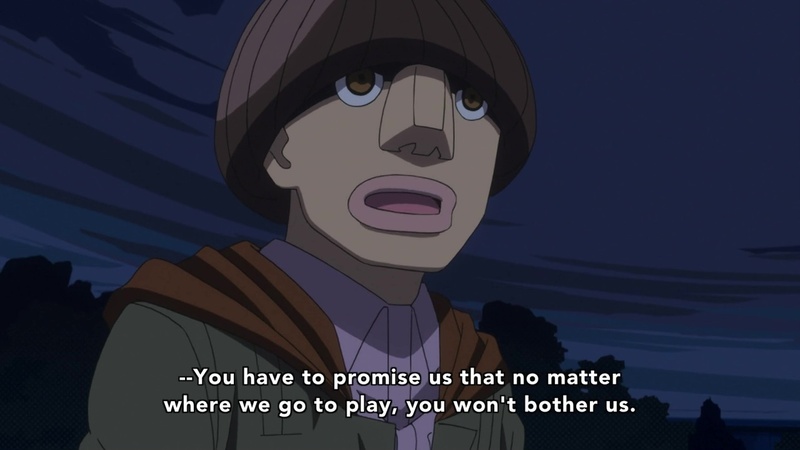 Your band member just got murdered in front of you, and your plan is to make sure your band can continue playing? He cheekily throws out a demand for an obituary fee for the guy, and then leaves, but it’s not like they try to recover the body or hold the agency accountable or anything. I wasn’t sure what I was supposed to feel for the band, but it’s sure hard to sympathize with them after that. 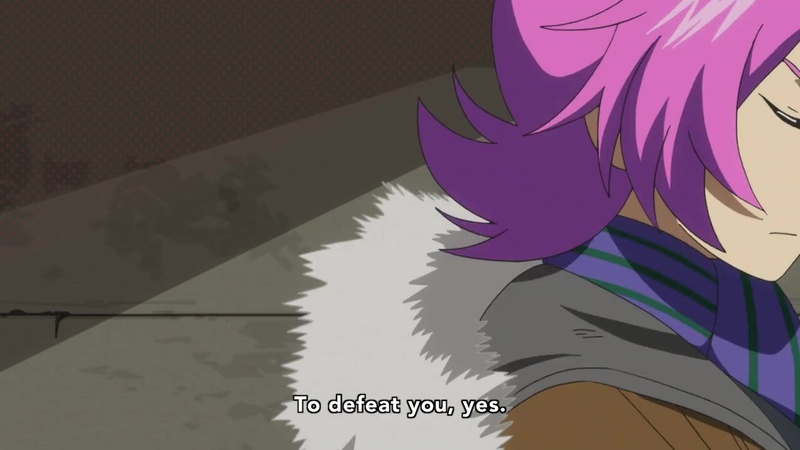 Still, it’s a good episode, and more of the details are starting to fall into place. I’m rooting for the show to keep it all together and give a strong story linking the present-day to the future.